If you're running Synchronet on a Microsoft Windows NT based operating system (e.g. Windows NT, Windows 2000, Windows XP, Windows 2003, Windows Vista, Windows 2008, Windows 7, Windows 8, or Windows 10), you can run Synchronet as a set of Windows Services. The Synchronet Windows Services are hosted by a native executable program. When run as services, Synchronet will start before the Windows Logon prompt is displayed and will run without a user logged in. Windows Services can be protected from being monitored or controlled (e.g. shutdown) by any user but the computer administrator. 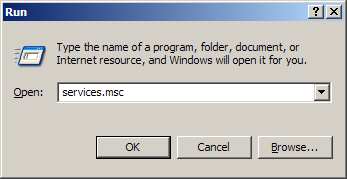 You should shutdown the Synchronet Control Panel (GUI) before installing the Synchronet Windows services. You may install, disable, or remove each Windows service independently, or all at once. The configuration of the Synchronet Servers and Services is handled in your Synchronet initialization files (i.e. sbbs.ini and services.ini). The Synchronet Windows services know the location of your Synchronet ctrl directory from the SBBSCTRL environment variable. by running the Synchronet Control Panel, or if the system is rebooted, the services will start automatically if enabled and configured for “AutoStart”. The Windows Services control panel applet may also be started with Windows Start→Run→services.msc. If service name not specified, default is ALL services. Synchronet Windows Services, like most Windows Services, can also be controlled with the Windows net.exe and sc.exe utilities. To start or stop all Synchronet Windows Services at once from a command-line, use the sbbsNTsvcs commands. The Synchronet Control Panel can be used to start, stop, configure, recycle, and monitor the Synchronet Windows services once installed, but it is not required for operation. If the Synchronet Control Panel is not running, the BBS servers will still function, even if no user is logged into Windows. You cannot “spy” on a BBS node running as an Windows service and the “Clients” window and the optional “Tray icon” in the Synchronet Control Panel will not reflect active clients connected to Synchronet Windows services. There are plans to integrate these features with the Synchronet Windows services in the future. NOTE: For the Synchronet Control Panel to correctly communicate with the Windows Service Control Manager, sbbsctrl.exe may need to be run “as administrator”. Not doing so may cause the Synchronet Control Panel to not be able to discover that the NT services are installed or running and it won't be able to control (e.g. start/stop) or communicate with the services. Log messages (determined by the LogLevel values in your sbbs.ini file) will be logged as Application event log messages (viewable in your Windows Event Viewer). If you wish to use a Windows debug output viewer (such as DebugView) to view the log output of one or more of the Synchronet Windows Services, set the “Start parameters” of one or more of the services (under the Windows Control Panel) to -debug. If you do not wish to run Synchronet as Windows Services (e.g. run them in-process using sbbs.exe or sbbsctrl.exe instead), simply stopping and (optionally) disabling the services is all that is normally required. This operation does not uninstall Synchronet.